Electronic cigarettes (E-cigs) and other vaping devices came to the market in 2015. These products soon became popular, and the brand JUUL quickly rose to the top. JUUL, marketed as an alternative to regular cigarettes, was meant to help smokers switch to a better and "safer" way of smoking, vaping. Because of its slim looks and small size, JUUL has become popular with teens over the past few years. JUUL vaporizes small cartridges (e-juice) of oil with nicotine salts, which are found in tobacco leaves. The liquid comes in different flavors such as mint, cookie dough, and many more. JUUL still causes damage to the user’s lungs, but at a slower rate than cigarettes. The debate still continues to whether vaping should be allowed. What makes JUUL popular among teens is that it’s usable both indoors and outdoors. It draws less attention than cigarettes and doesn’t leave behind a bad smell. There are different flavors of e-juice that have a more “pleasant” taste and smell. Unlike vaping, regular cigarettes can trigger smoke detectors, and leave a bad stench in the area. They can also affect the people around the user because smoke given off by the cigarette can be inhaled involuntarily. This is called second-hand smoking, which is also a great danger among teens. 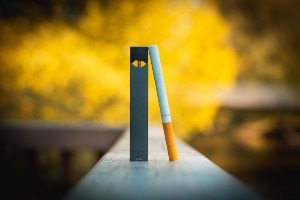 JUUL is easy for teens to use because they have a modern look. They are concealable and can be mistaken for a USB drive. In fact, JUUL can be charged in a USB drive. A Vape Starter Pack costs $25-$35, which is affordable for teens. It comes with the device, charger, and e-juice. The average cost for a 15ml bottle of e-juice is $12 or less if purchased online. A 15ml bottle is about the equivalent to just over a carton of cigarettes. This makes vaping a relatively inexpensive habit. The U.S. Department of Health and Human Services is discouraging e-cig vaping. In a recently launched campaign, the campaign speaks about all kinds of vaping, but heavily mentions JUUL and the consumption of it by teens. The small amount of nicotine that is consumed with vaping can still cause a lot of damage to teens. The nicotine salts in the vaping liquid can affect young users’ lungs and their brain development, especially if it becomes an addiction.